To celebrate the 10th anniversary of this truly unique label they choose to shower us in gifts, I wish every birthday was like this - except mine of course. As a mark of this grand occasion those kind people at Big Dada have released an awesome double CD, a DVD and a special anniversary party. I don't think there exists a label that is so trustworthy that you could buy any record it released in the safe knowledge that you'll love it, but for years I've been buying Big Dada releases knowing that I may not like it but it won't be anything to do with quality. The label has proved itself time and time again for an undying commitment to challenging and innovative music and the hip hop genre has been draped loosely around its neck but has never weighed down its steady upward progression. Label boss Will Ashton wanted to form a label that ran alongside yet independent of the mothership Ninja Tune label and would provide a home to hip hop misfits and pioneers. Never describing themselves as a UK hip hop label, Will Ashton prefers to see it as simply "a hip hop label based in London" and with artists from the US and France on their books Big Dada must be one of the most international hip hop labels around today, and in this fact lies Ashton's most significant achievement. He has certainly championed some of the most successful UK artists like Roots Manuva, Willy, TY etc. but he has stripped them of their laborious 'UK' title and brought everything down to Hip Hop. 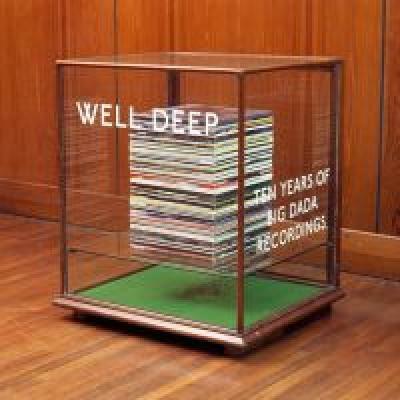 The CD is less of a 'best of' and more of an overview of the labels history and philosophy and it's only when this back catalogue is put together in this context that you start to get a clear picture of just how special Big Dada is. It is truly innovative but certain artists carry this flag more than others and any label boasting releases from cLOUDDEAD, New Flesh, Mike Ladd and TTC can't help to be slightly left of centre. Even from the title it's clear that Roots Manuva is the jewel in the crown of Big Dada and rightly so. I have always considered his debut Brand New Secondhand to be his finest work, but when you put them all together and drop in the flagship song Witness (1 Hope) he really is quite impressive. Mike Ladd's many incarnations keep things interesting and if things were getting a little too hip hop there's plenty of curve balls from TTC, Busdriver and newest signing Spank Rock to mix things up. What other label would put together the smooth storytelling of TY with the low down Grime of Willy? Though not particularly well represented here cLOUDDEAD really stand out from anyone and before their demise they single handedly took this label to places no other artist could go. Wherever they resided this band acted as a simmering cluster bomb blowing apart any preconceptions of genre that a label may have possessed and it took real vision to include them in the early days of this label. Which leads me on to the DVD. Apart from the Big Dada documentary, this DVD is really about the videos. It has something like 35 videos here which must be everything that's been made. There's an impressive megamix option or you can play each video through one by one or you can set it to random so if your tv's got good enough sound this would make an awesome video juke box. Just stick it on and go about your business but you'd get snarled up on the lengthy cLOUDDEAD tour footage which is so compelling it demands your full attention. Videos from New Flesh and the crazy world of TTC are a treat, but as usual Roots Manuva steels the show with his return to his former primary school for sports day in the Witness video. All in all this is a wonderful package indeed, and I'm not talking about Roots Manuva in his leotard. It's a great celebration of ten years of forward thinking - and for any fledgling hip hop mavericks with wild ambitions, while Big Dada is around the world must seem like a much more welcoming place.